I'm amazed it made it this long. Some idiot installed it wrong. One of the sides was "too close" to the house. There was a concrete block wall within a foot of the one side and you could never get to it. Fins on the compressors are what do the actual work of moving the heat from the hot side of the air compressor to the air that gets pulled through by the fan. If you can't keep them clear of dirt, the whole thing gets much less efficient. 33 years is a long way to go without being maintained. That was one of two sides that got blocked. There was a small section of wooden security fence next to the second side. A whole two feet away this time. It basically means that we ended up paying more to keep the Box of Rocks that is this house cooler. The new one wasn't put so close to the house or the fence, and the small section of fence needs to get removed anyway. We knew it was getting tired anyway. The fan would kick on and the bearings would grumble. You could hear it inside the house one or two rooms away. More amazing was that it kept going, rust and all. The new one has four sides full of compressor fins and promises a much higher efficiency, 16 SEER if that means anything to you. I had to look that mess up. You want more SEERs than fewer. 14 is the minimum in the South of the US, More is better. Mind you, my inner tinkerer was running wild. Copper tubing to make radio antennas. The fan that was dying would make a great fan for the back porch. It would be fun to push the mosquitoes over into the next yard for a change. I mean, we can't use the pool without a fan pointed at it some nights. Oh No! You moved out of the fan and now the mosquitoes carried you off! But I was warned. "You don't want that stuff! You don't have the room!". Spoil sport. A tinkerer can dream, can't he? Oh and that new compressor? Cools the house off a degree each 30 minutes when the temperature is 90 outside, and it actually seems to be keeping up with the heat. 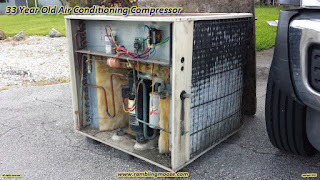 That old compressor would struggle and then fail to cool the house. In the hottest days of the year when it would get to 96, but never hotter if we had a sea breeze, the compressor would run constantly until dusk. That Box of Rocks that I live in gets warm and stays warm. Bye Bye Compressor, there's a new kid in town!